Feeling nostalgic? Take a trip down memory lane at these historic restaurants in India. Many of them date back to the pre-Independence era and are wonderfully atmospheric. 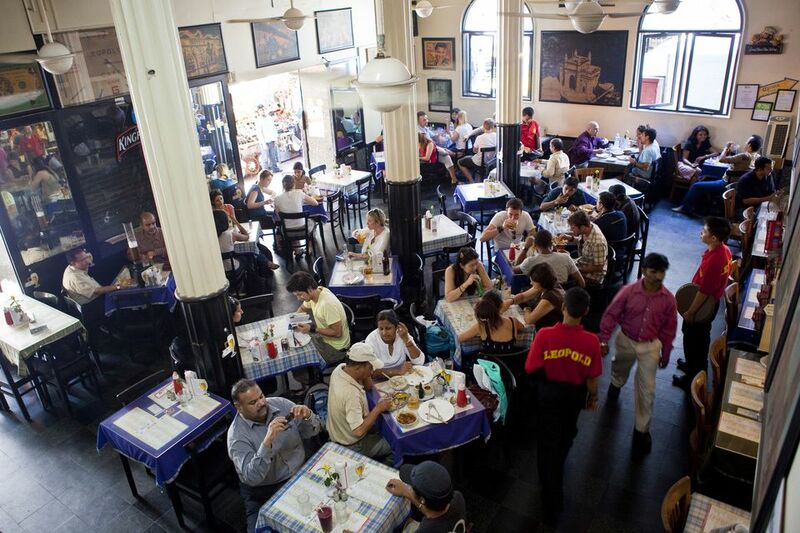 A popular tourist place to hangout in Mumbai, Leopold has been around since 1871 and is one of Mumbai's oldest Irani cafes. (Distinct from Parsis, Iranis are Zoroastrians who came to India much later, in the 19th century). More of a landmark than a restaurant, its claim to fame is that it's "getting better with age". Undoubtedly, it's true! Not only does Leopold feature prominently in the epic Shantaram, in which Gregory David Roberts recounts his checkered past in Mumbai, it also survived the 2008 terrorist attack. (Bullet holes still remain on the walls, as a reminder and tribute to those who lost their lives). Leopold is invariably packed with people reliving its legends over huge pitchers of beer (or beer towers, for the really thirsty!). The food is diverse (Indian, Chinese, and Continental), the servings are large, and there's a cozy upstairs area with DJ playing tunes into the night. Opening Hours: 7.30 a.m. until midnight. Cost: 1,600 rupees for two people. What to Try: Leopold special chicken pasta or special veg pasta, chicken stroganoff, prawn chilies. One of Mumbai's iconic must-try Indian restaurants, Britannia & Co has been in business since 1923. It was one of the many restaurants founded by the immigrant Parsi Zoroastrian community (which came to India, via Gujarat, from Persia in the 10th century to escape Arab persecution). Now, it's one of the last of its kind remaining. Parsi cuisine curiously blends Persian and Gujarati influences. The restaurant is housed in a grand Renaissance-style building designed by Scottish architect George Wittet, who also designed the Gateway of India. It has a fitting, pervasively vintage, ambiance. Even the owner is a treasure! Delightfully eccentric and aged in his 90s, he regales foreign guests with stories, particularly anyone who's British (he loves the royal family). What to Try: The famous berry pulao (with meat, paneer or vegetables). It's made using the secret recipe of the owner's late wife. The legendary Karim's has been "serving royal food to the common man" since 1913. Its notable origins go all the way back to the time of the last Mughal Emperor, Bahadur Shah Zafar. Karim's ancestors worked in the royal kitchen in the Red Fort but fled after the Emperor was dethroned. Haji Karimuddin returned to Delhi to sell food to those going to the 1911 Delhi Durbar, which was attended by King George V and held to commemorate his coronation. Two years later, he set up his restaurant. Karim's is now into its fourth generation of management and is ranked as one of the best restaurant for north Indian cuisine in Delhi.There's no fancy decor or inviting ambiance but the food more than makes up for it! The Old Delhi location also provides a fascinating look into a side of Delhi that many visitors don't get to see. Opening Hours: 9 a.m. until midnight. Cost: About 800 rupees for two people. Cash only. What to Try: Mutton korma, mutton stew, chicken Mughlai, and chicken jahangiri. Or, if you're really adventurous, the brain curry! If you're a vegetarian you might want to give Karim's a miss. The Indian Coffee Board founded the first Indian Coffee House in Mumbai in 1936. More outlets across India followed. These establishments were popular meeting places for intellectuals, freedom fighters, social activists, revolutionaries, and bohemians. However, business declined in the 1950s, and the Indian Coffee Board decided to shut them down. Employees who lost their jobs got together to form a series of worker co-operative societies and run the coffee houses themselves. Now, there are about 400 of them in India, managed by 13 cooperative societies. Possibly the most famous Indian Coffee House branch, opened in 1942, is located opposite Presidency College on Kolkata's College Street. Students frequently hang out there to converse and exchange ideas. It's all about the nostalgia! Opening Hours: 9 a.m until 9 p.m., Monday to Saturday. 9 a.m. until 1 p.m. and 5 p.m. until 9 p.m., Sundays. Cost: 300 rupees for two people. Cash only. What to Try: Mutton kaviraji, chicken Afghani, mutton cutlet, veg cutlet, chicken sandwich. And, of course the coffee! Just don't expect fast service and quality food. For fuss-free south Indian vegetarian cuisine, head to Mavalli Tiffin Rooms (commonly referred to as MTR). This legendary restaurant has been dishing it up since 1924! It's the oldest idli dosa place in Bangalore, and classic must-try restaurant there. The restaurant's main claim to fame is that it invented the rava idli, during World War II when rice was scarce. It quickly developed a reputation for hygiene and cleanliness. Such is its popularity these days that customers line up on the pavement outside. However, the restaurant was forced to temporarily close down during the 1970s, when the government called a state of emergency and forced it to lower prices to unsustainable levels. During this time, the innovative owner diversified into selling ready-to-make packaged mixes for idlis and dosas. MTR Foods has grown to become one of India's leading packaged foods companies. Opening Hours: 6.30 a.m. until 11.00 a.m. for breakfast. 12.30 p.m. until 2.30 p.m. for lunch. 3.30 p.m. until 8.30 p.m. for snacks and dinner. Closed Mondays. Cost: 300 rupees for two people. What to Try: Rava idli, masala dosa, and pure filter coffee. The trademark dessert, Chandrahara, is only served on Sundays. Trincas harks back to 1961, during the glory days in Calcutta (as it was then called) when city was arguably the most important in India. Park Street was abuzz with glitz, glamor, live music, and endless parties. The restaurant started out as a tearoom, founded by a Swiss gentleman named Trinca, in the 1920s. Its new owners converted it to its current form and introduced band music to the city. Trincas is the only place on Park Street where the live music never stopped, even today. Unfortunately, the restaurant's decor hasn't remained the same though. The elegant high ceiling and arches are gone, and ordinary white tiles have replaced the plush carpets, making it sadly devoid of its past charm. Opening Hours: 11.30 a.m. until 11.30 p.m.
What to Try: Shredded lamb, kebabs. A favorite restaurant for lovers of idli sambar in Chennai, the original Ratna Cafe was set up in Triplicane in 1948, just after India gained Independence from British rule. Interestingly, it was not established by a south Indian, but rather by the Gupta family from Mathura in Uttar Pradesh. Unlimited sambar, made from a secret traditional recipe, is poured from a large bucket to appreciative diners. Opening Hours: 7.30 a.m. until 10.30 p.m. Cost: About 300 rupees for two people. What to Try: Idli sambar, undoubtedly. Plus, the award-winning Special South India Filter Coffee.